For me, the loss of 15-pounds is good, but losing that much in a week is not what one would want to see. So, after a complete physical and the doctor looking over the ER charts (ah, the joys of modern computer technology when medical records can be sent digitally to those who need them), it is the generic version of Prilosec OTC® (got to save some money someway) for now and a follow-up visit with the doctor in two months. The blood lab work will be sent to me and should there be something negative there, the doctor and I will hook up sooner. So that’s out of the way for the moment with the doctor giving the usual good advice before I left. This entry was posted in Uncategorized and tagged medical on January 10, 2009 by AstroNerdBoy. So, a trip to the ER and five hours later, no heart problems or major organ problems that could be detected (and they did a lot of tests). The doctor determined that I have Gastritis and combined with the strained muscle in my left shoulder blade, this gave me all the symptoms of the problem I had. With as primitive as our medical technology still is, her diagnosis is still a best guess, but baring some other things happening, we’ll just take it that this is in fact what I have — Gastritis. A couple of things were revealed to me while in the ER. First, I miss my TV. I haven’t had satellite for some time now and getting to watch some documentaries on Discovery Channel made me really long to get my service restored. But I can’t do that, more so since this ER bill is likely to be outrageously expensive. Second, I guess I’m really missing human contact. When I had my job, I talked a lot with my co-workers. We were a tight team and though we didn’t agree on things like politics or religion, it didn’t matter. Savage Piper, Taco’s Rule, Red Baron, Lepidus, and the others were people I enjoyed talking to. I miss the laughs we shared as well as the shared frustrations when annoying people like “Busy” would cause us more problems than the initial problem being reported. So, I’ve decided that even though it is an extra cost, I will start going to church on Sunday’s. Traveling to Greeley may seem a bit much, but the church I’d attend there is one that I believe preaches the Gospel so it is worth the travel in that regard. Either way, I don’t think that wanting to be with other children of God is a bad thing at all. Hopefully, I can hook up with my former comrades this month, assuming everyone’s schedule can be cleared. This entry was posted in Uncategorized and tagged medical on January 5, 2009 by AstroNerdBoy. This entry was posted in Rants and tagged medical on September 30, 2007 by AstroNerdBoy. I ended up taking last Wednesday night, Thursday night, and Friday night off due to the illness. I came into work last Saturday night better (much less coughing) and finally sans a low-grade fever that I’d sported the other days. I was pretty wasted but I made it through the night. Over the last three nights, I’ve basically taken it easy, taken my drugs, and done my nebulizer treatments. I still have some coughing fits from time to time (non-productive ones, which makes them kinda frustrating) but overall, my cough has been reduced by about 85%. So that means that I can sleep without waking up to massive coughing fits. I’ve also purchased a new swamp cooler and have elevated the humidity in my apartment to just under 30%. I think that has helped as well. I’m thankful to God for getting me through this. I usually get a nasty cough every winter, but this one was the worst yet. I don’t know if there was something different about this illness or if I’m just getting older. Regardless, I appreciate the thoughts and prayers of those who gave them. This entry was posted in Uncategorized and tagged medical on March 29, 2007 by AstroNerdBoy. Man. This has been an awful last few days. I didn’t make it down to Colorado Springs because of my cough and I’ve had very little sleep over the past few days. So, that meant getting a doctor’s appointment today. The official diagnosis is unknown to me. The doctor put me on a nebulizer to help open up my air passages and gave me a prescription to own my very own nebulizer. I’d never even seen a nebulizer until the months before Grandpa died because he needed one. So my needing one certainly made me go, “Hmmmm” (followed by a non-productive coughing spell). The doctor also gave me a prescription for another antibiotic and a more intensive regiment of Prednisone. Finally, I got dispatched to get a chest x-ray. Fortunately, Longmont isn’t a big town so most things are fairly close by. 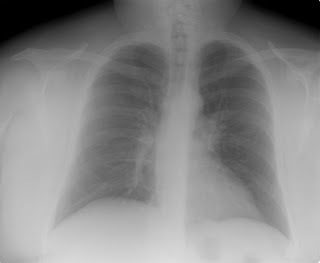 The medical center that I went to for the chest x-rays was less than a mile away and after a wait (where a single mother had her 7-year old girl in for chest x-rays after having made a nebulizer purchase) , I had x-rays taken. Check them out. I don’t know what these mean, but they are interesting just the same. After the x-rays, I stopped by Walgreens and dropped off my prescriptions. Then it was on to score the nebulizer. Sadly, they didn’t take my insurance (something about not being contracted to do so), so I forked over the $100 for the device (The Lord provides!). Then it was onto the new Kentucky Fried Chicken in town to grab some lunch to go (and because its new, the chicken tastes pretty good) before starting my return voyage to the pharmacy and then home. I am exhausted. I have to try to get some sleep, drink a lot more water, and Lord willing, I’ll be well enough to come in to work Wednesday night. This entry was posted in Uncategorized and tagged medical on March 19, 2007 by AstroNerdBoy. Ugh. I have the cough that just won’t go away. Back on February 19, I got sick and the cough has just held on like mad. I get this every year, but it is a bit frustrating. Anyway, nearly two weeks ago, I went to the doctor to get this checked out. The doctor remarked on how I wasn’t faking the cough and suspected lung irritation and a possible infection. 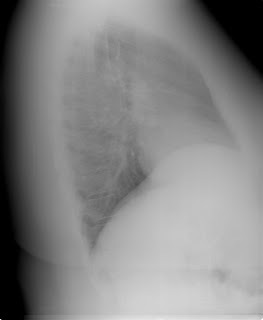 The lung irritation would make me cough, which would irritate the lungs more, which would cause more coughing, thus feeding itself. In an example of how primitive our medical science still is, the doctor tossed me an antibiotic and a drug for my lungs. He provided a diagnosis, but lets face it (and no offense to my Doctor), he has no real clue what’s wrong. So, I finished up the last of the drugs Wednesday morning, with no improvement in my condition. Wednesday night into Thursday morning was more of the same, but Thursday night into Friday morning was awful. My lungs felt like crud and my cough got worse. I felt ill and desperate to just craw into bed. I made it through though and I skipped exercise class in favor of sleep. Its rare for me to sleep any length of time before waking up, but I slept nearly 5-hours without waking up. Rolling over caused the coughing fits to start so I was awake for nearly 2-hours before getting a little more sleep before coming in tonight. Still, the cough is bad at times, so much so that folks have joked that I must have TB. At least this is my final night. I can get some rest and Lord willing, I’ll be good to head to the Springs Sunday for church and a family visit. This entry was posted in Uncategorized and tagged medical on March 17, 2007 by AstroNerdBoy. In other news, the weather forecasters teased us again and of course got things completely wrong. I don’t remember which day it was, but just before the last system came through, we were supposed to get up into the 60’s. Instead, we got up to around 50. Further, that night we were under a winter weather advisory as the 2-3 inches of snow we were supposed to get were going to be blown around a lot. We didn’t get a flake and the wind wasn’t nearly as bad as they said either. Just goes to show you (again) how predicting the weather and its impact is still a great deal of guessing (no offense to those who do the weather). Sometimes, I wonder if God tweaks things just to make the wise foolish. I’d love it if God would make the global temperatures unexpectedly drop by a significant amount just to tweak the sky-is-falling crowd. Speaking of snow, since we’ve had no additional snowfalls of any significance here (they have south and east of my location), most of the snow is gone. There are still big patches in shaded areas but those are shrinking. The mountains of snow in parking lots are now just mounds and soon will be completely gone. The weather predicts a bit of snow Wednesday and Wednesday night but I doubt we see anything. Still, as spring approaches, the weather systems will shift again and we’ll start seeing upslope conditions which will mean more snow, but amounts that will disappear in a day or so. This entry was posted in Uncategorized and tagged medical, weather on February 27, 2007 by AstroNerdBoy. Well, my fever is down (thank you Lord) but my sinuses are a wreck at the moment and my ribs are sore from all of the coughing I’ve done. I’m going to have to empty all of my trash cans because I’ve filled every one of them with used tissues. And at this point, I’d like to say that Puffs Plus tissues are the bomb! Still, I need a lot more sleep. I only sleep bits and pieces here and there, waking up frequently but never getting more than about 2-3 hours of total sleep at a time. That’s because my sinuses become so choked that after blowing it, I have to get up and move around to try to get them to open somewhat. Sometimes that takes a while to happen. So even though it is Tuesday morning, it feels like it should be Thursday by now with the mini-days/nights I’m experiencing. It will be nice to get a longer stretch of sleep to be sure. Well, I’ve read my Bible, eaten my chicken soup and will just not do much today but try to get well to go to work tomorrow night. So I think I’ll watch some anime or something. Update (12:21) : Man, it sure hurts to cough. I really have strained the muscles in my ribs because every cough makes me aware of just how many muscles we have there. Well, its time for aspirin and hopefully some sleep and maybe they’ll feel better tomorrow. This entry was posted in Uncategorized and tagged medical on February 20, 2007 by AstroNerdBoy.